¡Buenas tardes a todos! I want to introduce a new guest blogger, Kristine MacKain, who has some great—and fun—stuff to share with us about life in Mexico. We’re always happy to hear positive things about this country we love so much, and hope it inspires more of you to come visit. Kristine MacKain, Ph.D. is a former research scientist and speech pathologist, now retired and living in San Miguel de Allende, Mexico. She and her husband, Cedric Johnson, are happiest when they are traveling, seeking adventure, and learning about world cultures and how other people live. Cedric says that each time Kris visits a beautiful and interesting place, she wants to live there. Consequently, he’s learned never to attach himself too firmly to their home base! Less than a month ago, my husband, Cedric, and I rolled into Casa Raab, our Oaxaca farm destination just outside Oaxaca City. We drove down from our home in San Miguel de Allende (SMA) on the Arco Norte, a new expressway that avoids Mexico City, passing through the city of Puebla, then dropping south through slate blue mountains into the state of Oaxaca. We are renting out our SMA home right now, and we were planning on a quiet month in the country, following the suggestions in our guidebook: doing some birding and taking some trips to the coast, touring archeological sites and artisan villages. Venturing into unknown territory, however, we could not have imagined the adventures that awaited us. The road into the property was dirt, rutted and bumpy. 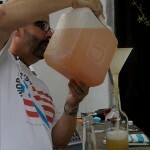 Close to the main house, four gringos crowded together outside behind a tall, narrow rustic bar-height table bent intently over a collection of tall glass bottles as one of them poured clear liquid through a plastic funnel. We followed Tony to the casita with our luggage, and he got right down to business: “Why don’t you two unpack later and join us right now for some mezcal tastings?” We were tired after the 7-hour drive, but we had just read a very interesting article in the New York Times pronouncing mezcal as “the next big thing” and describing it as “complex, gorgeous and endlessly intriguing, distinguished like great wines by a strong sense of place.” The place to which the author was referring, of course, was Oaxaca. How could we refuse? Mezcal is crafted by hand almost exclusively by small, homegrown distil leries, and Oaxaca has more mezcal distilleries than anywhere else in Mexico. 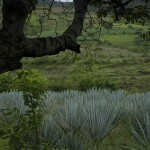 The drink is made from various species of the agave plant, called “maguey” in Spanish. It has a smoky flavor and tastes vaguely like single-malt scotch. We were anxious to try it. Relaxing at the mezcal bar with Tony and his guests, we learned that the guests were from Washington D.C., and had been to Casa Raab several times, seeking adventure in the machinations of a homegrown mezcal operation. 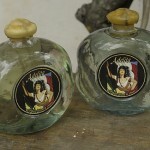 They hoped to become mezcal connoisseurs and introduce several types of mezcal to their friends back in D.C.
We found we could quickly discriminate between mezcals that had been aged for several years and those more recently produced; mezcals also differ in color from clear (recent) to caramel (aged, in oak barrels). 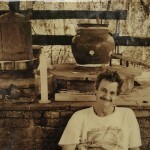 Tony has a band called The Bodega Boys, a revolving group of guys and gals who live part of the year in Oaxaca, and play each week at the mezcal bottling site. Would we like to join them in their next jamming session? Well, we didn’t sing or play an instrument but Tony said that didn’t matter, just show up! A week later Cedric had to go back to the states for a few days and Tony asked me to come watch his band. There was no audience but me so they talked me into singing with them! (This was much easier once I’d had a few mezcals). I even played the tambourine. We sang for THREE hours. They asked how long it had been since I’ve sung with a group and I said, “About 45 years….” (I think that was the madrigal group in high school). Two weeks later, the band had Cedric playing the bass. The most fun aspect of travel, I think, is the unexpected. As I planned this vacation, could I have possibly imagined that Cedric and I would be drinking homemade mezcal, singing and playing the bass with a bunch of guys in a local band?? How fun Kris,I look forward to keeping up with your travels and interesting adventures via your blog. I gave up on pulque – mescal sounds better! I met Kris and Cedric in SMA one year ago in a lovely organic garden at the equestrian center; a luncheon for a group of adult Spanish Language students. We discovered we were kindred spirits and our friendship has grown – like that organic garden and in the spirit of beautiful San Miguel. I live in Austin, Texas and travel to SMA whenever I have the opportunity. I have planted my soul in gardens, old silver mines, exquisite churches and old buildings. Each time I visit I am struck by the beauty of the land and the people. Multi-cultural, it is a bastion for artists and creative thinkers. Did you know it hosts an international Poetry Week the first week in January of each year?! This year, one of the honored faculty is Tony Hoagland. If you haven’t read his poetry, treat yourself! He has a way of transporting you to places you’ve never been. Listen in, the last night of Poetry Week is open to the public and each of the students and visiting poets present their work. Speaking of being transported – once you visit San Miguel, you will understand why this feels like a quiet prayer. Kristine…in a few words you have captured the illusive spirit of this incredible state and town. Every corner turned is a surprise here. Look forward to the rest of you entries! I hope you cover the beautiful artesenia story that is Oaxaca. Kristine, what a great story. We’d love to meet you when you’re in San Miguel. My husband and I visited San Miguel de Allende for 5 days in 2004. He had been very reluctant about going to “Mexico.” We had vacationed in Brownsville in the ’70s and had crossed into Reynosa or Matamoros, don’t remember which, but it was a dirty place, the temps and humidity were horrid, and he really hated it. My cousin and his partner had lived in San Miguel for several years at that point in 2004 and continued urging us to visit. Hubby finally broke down and said “OK” but I know he was not thrilled with the idea. After our 5 day stay, both of us agreed we were going to come back to live here when we retired. Finally, in July 2008, we made it. When we arrived in SMA, we both felt like it was home. We are retired, in our 60s, and consider this our “final destination.” We could not be happier. There is no place on this earth that we would rather be. When you ask a Mexican here how he/she feels, the answer is typically “contento.” You can figure out the translation. Another word often bandied about is “tranquillo.” Again, figure it out. Don’t believe that all of Mexico is dangerous and full of narcos and drugs. This is a peaceful city. Visitors are welcome and frequently return for more. What an enticing account. I could taste every drop! Jamie and I will soon be packing our bags. Muchas gracias for sharing. I love my life living in a “Campo” just outside San Miguel de Allende. I have never felt so safe and at peace. I have gorgeous views of the SMA Presa(reservoir) and the surrounding country-side. I have built 2 homes on my property for rentals and I look forward to having them filled with people that enjoy both the sense of community and respect for privacy. AND hopefully will love my gardens!!! You put a smile on my face. Thanks for the post.